NEW YORK — In a historic move giving Orthodox women in the United States more authority to answer halachic questions on family purity, the first class of women advisers in Jewish Law graduated on Sunday. Five women graduated from the North American branch of Nishmat’s yoetzet halacha program in a ceremony at Congregation Sheartith Israel, Spanish and Portuguese Synagogue in Manhattan. 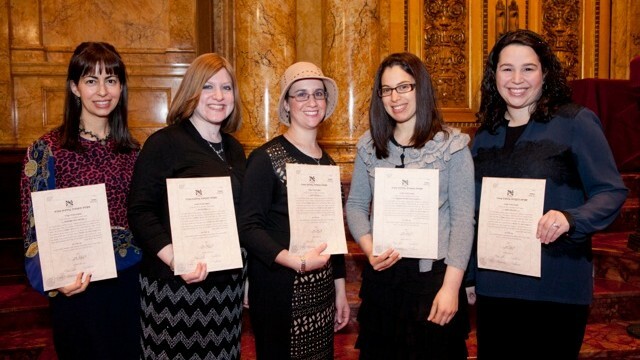 The five women, Dena Block, Nechama Price, Lisa Septimus, Tova Warburg Sinensky, and Avital Weissman, received certification as yoatzot halachaafter completing two years of comprehensive study and examinations from Nishmat’s Miriam Glaubach Center for Advanced Torah Study. Block, Price, Septimus, Warburg-Sinensky, and Weissman are pioneers in the field, the first women in America to have been trained to be yoatzot halacha, women advisers in Jewish Law, including but not necessarily limited to family purity law. Housed at Maayanot Yeshiva High School in Teaneck under the auspices of Rabbi Kenneth Auman, dean of the US Yoatzot Halacha Fellows Program, the five women studied hilchot niddah, as outlined by the Israeli rabbinic curriculum, combined with an overlook of women’s health issues such as contraception, fertility, sexuality, and psychology. The graduates have all accepted positions in synagogues and institutions in and around the New York area. Rabbi Yonah Reis, Av Beit Din of the Chicago Rabbinical council and a Yale Law graduate, delivered the keynote address, praising both the program’s depth of study dedication, and its dedication to create strong female leaders in the Jewish community. The phenomena of yoatzot halacha first evolved in Israel 16 years ago because many women feel uncomfortable asking male rabbis certain family purity questions. “It’s just like I would feel more comfortable with a female gynecologist. It’s private,” said Adira Botwinick, a newly married professional. Rabbi Dr. Jacob J. Schachter, Yeshiva University professor of Jewish History and Jewish Thought, said “thousands of women who never before asked questions now feel comfortable doing so, knowing that they will get answers informed by deep halachic wisdom and sensitivity.”In his keynote address, Reis notes that there was a time when women either were not educated or did not feel comfortable enough to ask their local Orthodox rabbis their family purity questions. Reis acknowledged that this behavior “lead to leniencies and unnecessary stringencies,” because women wouldn’t ask. Made possibly by Felix and Miriam Glaubach, this is an American version of Nishmat’s yoetzet halacha program which was founded in Israel by Rabbanit Chana Henkin in 1997. Nishmat has certified 85 yoatzot to date. Nishmat’s pilot US program was launched in 2011, and it offers one of the highest levels of female Torah study in the United States. Although there was significant backlash when the Israeli program launched, the opposition noting that it was untraditional and immodest for women to learn these subjects and advise on such matters, it is now endorsed by fifty influential rabbis. Among them, Rabbi Dr. Norman Lamm, third president of Yeshiva University, who was, according to Dr. Giti Bendheim, Yoatzot Halacha Chair of the American Friends of Nishmat, “the first internationally acclaimed Jewish leader to speak out supporting [the program].” Lamm’s granddaughter, Tova Warburg Sinensky, is one of the program graduates.